A New Jersey man started his lottery adventure on the wrong foot! Mike Weirsky bought his Mega Millions tickets at a Quick Chek store in Phillipsburg, New Jersey. Distracted by his phone, he left without the tickets. 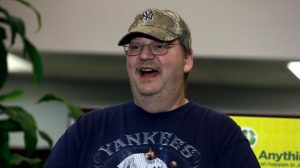 He eventually won the $273 million jackpot after a kind stranger found and returned his winning ticket to the cashier. The stranger could have kept and cashed the tickets if he wanted to! After realizing what had happened and coming forward to claim his prize, the 54-year-old man held a press conference. He mentioned that he wants to find and repay the good Samaritan who returned his jackpot-winning Mega Millions ticket. I’m looking for the guy that handed them in, I want to thank him. I’m going to give him something, but I’m going to keep that private. A lottery official explained that the stranger could have kept the winning ticket and claimed it from themselves! This honest gesture is even more remarkable, and Weirsky was taken aback by this act of kindness coming from a mysterious stranger. I was just very thankful that there was an honest person out there, because I figured it was gone. Weirsky’s win came at the right time, as he hasn’t been employed for a long time and his job hunt proved unsuccessful. He plans to cash his winnings in a lump sum, which amounts to $162 million. After learning he is now a multi-millionaire he has no plans of searching for jobs. His personal life also started catching up with him. He got divorced back in October after a 15-year long marriage. His ex-wife, Eileen Murray, declared that she has been supporting him throughout their marriage as she was the only one employed. She has also been paying him support after their marriage ended. However, she doesn’t want him back, even with his newly-found fortune! He’s not appealing to me all of a sudden because he has this money. At a press conference, Weirsky declared that his ex-wife contacted him, but she says this didn’t happen. Eileen Murray only thinks that even after she supported him for so long, he will not do the “right thing”. Weirsky declared that he doesn’t want anything to do with his ex-wife and he plans to enjoy his newly-found fortune. Although this is not one of the top Mega Millions jackpots, it is still an impressive sum that will change his life for the better! He wants to remodel her mother’s home and also buy a car for her. He will get a Ford Raptor pick-up truck for himself and then simply enjoy a care-free life! I always wanted to know what it would be like to be able to just wake up and be able to go somewhere, buy something. And when I get the money I’m going to do that. Let’s hope that Mike Weirsky will get to enjoy this money and make the best of his luck! You could also become the next Mega Millions winner if you start playing this popular lottery!